Saturday’s pitching matchup alone — All-Stars Tim Lincecum and Brandon Webb — should be worth the price of admission alone, especially when bleacher and view reserved seats are $11 off thanks to the ongoing K-Zone Ticket Offer. The first 20,000 fans will also get a Giants Greatest Moments postcard set. If you get to the ballpark early, don’t expect to see batting practice. Instead, you can catch the always entertaining Family Softball Game, in which the children of the Giants players and coaches get to take over the field for their own contest. Here are some photos from the 2006 event (I wasn’t at the ballpark for last year’s game) — wow, none of those players are still with the team. Sunday’s giveaway, when the Giants wrap up their lengthy homestand, will probably be one of the most popular of the year — Matt Cain bobbleheads. Get there early, since lines will likely form several hours before gametime. It’s also a matchup of Cy Young-winning lefties: Barry Zito vs. Randy Johnson. So which is cooler, a Matt Cain bobblehead or the Crazy Crab bobblehead? By the way, Friday’s Forever Giants Friday guest was Tito Fuentes, who’s now a color commentator for the Giants’ Spanish-language broadcasts. It shouldn’t be too tough to get tickets for the Giants’ three-game series against the Nationals this week, but if you’re looking for a great deal on either really cheap seats or really good seats, I’ve got a few tips. First, the entire series features KNBR ticket specials, with seats in the View Reserved Outfield available for only $6.80. If you’re a fan of the Giants flagship radio station’s personalities, many of them will be at Thursday’s day game, working as members of the grounds crew, balldudes and peanut vendors, singing the national anthem, participating in pregame contests and more. Wondered how people get to sit in those amazing seats right behind home plate and next to the dugouts? Well, some are available via a ticket auction run by the Giants with a portion of the proceeds going to the Giants Community Fund and Community Access Ticket Service. Select games, including some versus the Dodgers, are up for bid right now. If you’re coming to the game Tuesday, bring $5 or a toy for the Giants’ Christmas in July Toy Drive and you’ll get a nifty orange Giants stocking. It’s also Family Safety Day, which usually entails an interesting safety festival along Terry Francois Boulevard. And if you’re a knitting enthusiast, get special tickets for Stitch-N-Pitch Night, a weirdly wildly popular event at ballparks across the country. And Wednesday, finish off your set of Gamer posters with the Omar Vizquel version, given to the first 20,000 fans. It’s Law Enforcement Night, so come salute those who help keep us safe. Quick side note — Standing in center field after Sunday’s game: a camel. You don’t see that every day. The animal was one of several on hand for the Giants’ annual Picnic in the Park for season-ticket holders. The team’s most loyal fans also got autographs from a host of Giants players, played catch on the field, enjoyed games and received raffle prizes. 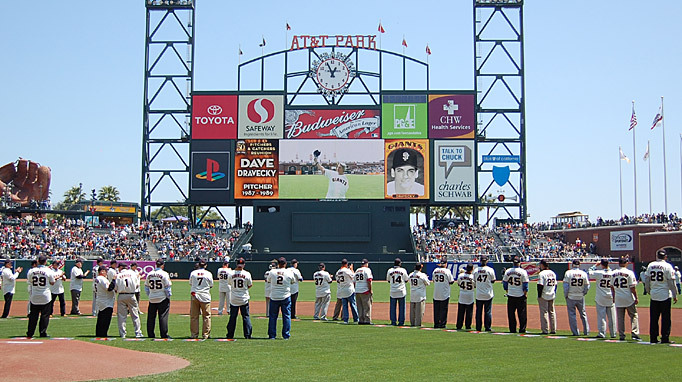 This weekend was a showcase for how important history is to the Giants’ organization, as they kicked off the three-game set with Dave Dravecky as the Forever Giants Friday guest. It continued on Saturday with the second of three wonderful 50th Anniversary reunions, this one for pitchers and catchers from the San Francisco era. Our associate reporter David Biderman did a story about the event, and I contributed some photos. On Sunday, the Giants celebrated Humm Baby himself, former Giants manager Roger Craig, who threw out the first pitch. Fans got Humm Baby T-shirts and the scoreboard showed highlights from the ’80s when Craig’s “You Gotta Like These Kids” teams did great things. It seems like forever since the Giants played a home game, but they’re back in action Friday against Vallejo native CC Sabathia and the Brewers. It’s going to be an exciting homestand, starting with Orange Friday and Crazy Crab Night. The anti-mascot, whose tenure lasted for just the 1984 season, will make an appearance, and the first 20,000 fans will get a Crazy Crab bobblehead. Before the game, there will be a special Crazy Crab Feed, where attendees will get a different version of the Crazy Crab bobblehead, this one with trash, rosin bags and gloves strewn at its feet (and its hat at a rakish tilt). Note that you need special prepurchased tickets to attend the Crab Feed and get the special bobblehead. Remember that it’s also a Forever Giants Friday, with a special guest signing autographs from 5:45 to 6:15 near the Giants bullpen. My guess is that it’ll be one of the players attending Saturday’s Pitchers and Catchers 50th Anniversary Reunion (listen to KNBR at 8 a.m. Friday to find out who it is). There’s quite an impressive list of players slated to attend this second of three 50th Anniversary reunions, including Dave Dravecky, Mike McCormick, Robb Nen, John Montefusco, Ed Halicki and Gaylord Perry. Following Saturday’s game, fans are invited to stay for the annual Fellowship Day, featuring testimonies from Giants and (likely) Brewers players. Former Giants manager Roger Craig is attending the reunion on Saturday, and he’ll also be there Sunday for a “Humm Baby” celebration. The first 20,000 fans get a Humm Baby T-shirt, and former Giants announcers Hank Greenwald and Ron Fairly will also be at the park. The homestand continues for six more games vs. the Nationals and D-backs, with promotions including a Matt Cain bobblehead, the annual Toy Drive and more. I’ll have further details on the remainder of the homestand later. See you at the yard! A quick reminder that there a couple of cool, albeit very different giveaways this weekend. On Saturday, the first 20,000 fans get the annual trading card set. On Sunday, in honor of PG&E Solar Day, the first 20,00 receive a compact fluorescent light bulb. Did you know AT&T Park was the first Major League ballpark to have solar panels? The Giants got a jump on this weekend’s salute to military veterans with their own Military Appreciation Night on Wednesday. Hundreds of military personnel and their friends and family were able to attend either with the Giants’ special ticket package or with the more than 400 tickets donated by season ticket holders. Servicemen and women and volunteers from Operation: Care and Comfort were stationed at the gates to collect donations for care packages. Fans could also take the opportunity to write a letter to a member of the military, like the family below (one son is showing off where he signed the letter written by Mom; the other is getting a high-five from an OCC volunteer). Barry Zito‘s Strikeouts for Troops program was honored before the game, and Army veteran Willie Mays received a plaque in recognition of his service. The Giants wore the special blue stars-and-stripes caps that all teams are wearing over the Fourth of July weekend in support of MLB’s Welcome Back Veterans program, and the night capped with a fireworks show. One fun note: On Monday, when I arrived at the park around 3 p.m., I saw a bunch of fans get a surprise as they waited by the visiting players’ entrance for autographs or milled around Willie Mays Plaza — jogging by were pitchers Jonathan Sanchez and Merkin Valdez, getting in a little workout with a lap around the outside of the ballpark.